Gee, New Fashion Channels Classic Beauty | Gee, Ya Think? Collaging is my all time favorite hobby. It not only indulges my love for fashion, but it feeds my creative energy. What could be better? 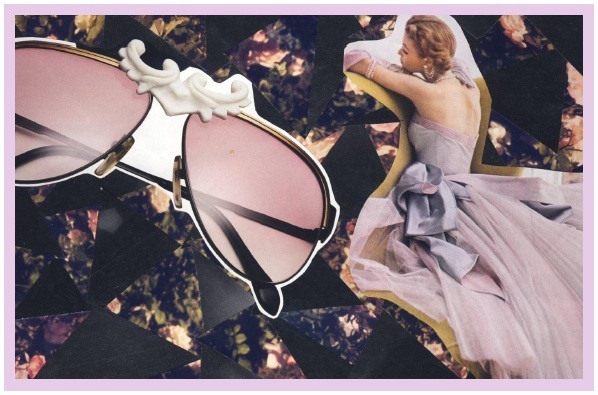 With this collage, I highlighted soft, rosy pinks with a contrast of dark grays and greens. The focal images are strikingly similar in subtle ways. I love how the quirky, modern sunglasses evoke a classic femininity and elegance matched in the female portrait on the right. Keep your eyes open – you never know when fashionpiration will strike.